This article is about the consolidated history of the 1986 established Ecolab Inc.; including its foundation in 1923 as Economics Laboratory, and the acquisition of Nalco in 2011. For the history of acquired businesses of Nalco, see Nalco Holding Company. Merritt J. "M.J." Osborn founded Economics Laboratory in 1923 with the tagline "Saving time, lightening labor and reducing costs to those we serve." The company's original product was Absorbit, a product designed to quickly clean carpets in hotel rooms. This was soon followed by Soilax, a dishwasher soap. During the 1930s, the company expanded throughout the United States and sales reached US$5.4 million by the end of 1940s. It acquired the Magnus Company in the early 1950s, which gave the company access to Magnus's industrial specialty businesses - including pulp and paper, metalworking, transportation, and petrochemical processing. In the 1950s, international expansion of Economics Laboratory started, with the establishment of its first overseas subsidiary in Sweden in 1956. It became a publicly traded corporation in 1957, and continued to expand during the 1960s and 1970s. In 1979, it acquired Apollo Technologies, but in 1983 the acquired Apollo subsidiary was shut down. In 1984, Ecolab acquired pest elimination leader Lystads, Inc., of Grand Forks, North Dakota. This is the first of many regional pest service firms acquired to create a national pest elimination business. 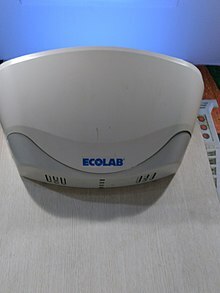 In 1986, the company changed its name from Economics Laboratory to Ecolab Inc. and is listed on the New York Stock Exchange. In 1987, the company formed a textile care division to serve commercial laundry customers that process at least 1 million pounds of linen a year. In 1987, Ecolab purchased the lawncare servicer provider ChemLawn for US$376 million. It sold the acquisition in 1992 to ServiceMaster for US$103 million as it couldn't turn ChemLawn into a profitable business. Ecolab and the German fast-moving consumer goods firm Henkel KGaA formed a 50:50 European joint venture called 'Henkel-Ecolab' in mid-1991 to expand into European/Russian markets. Ecolab would continue to acquire companies in the 1990s, namely Kay Chemical (1993), Australia-based Gibson Chemical Industries Ltd (1997), and GCS Service Inc (1998). In 2001 it bought out its partner Henkel's 50% stake in the European joint venture, Henkel-Ecolab. Ecolab integrated the former Henkel-Ecolab into its existing global operations. As a legacy of the Henkel-Ecolab cooperation from 1991–2001, Henkel continued to hold a 29.5% stake in Ecolab Inc. after the sale of the joint venture. In the mid-2000s, strategic acquisitions continued, and Ecolab diversified its portfolio of customer offerings by venturing into the food safety management business as well as a healthcare business unit. In 2005, it opened a new global research, development, and engineering center in Eagan, Minnesota. In 2006, Ecolab won the Black Pearl Award for Corporate Excellence in Food Safety and Quality, presented by the International Association of Food Protection (IAFP). In 2007, Ecolab acquired Microtek Medical Holdings, Inc., expanding its infection prevention expertise and offerings to hospitals and other healthcare facilities. In 2008, Henkel sold all of the 73 million shares, i.e., nearly a 29.5% stake it held in Ecolab, ending the two-decade-long partnership. The same year, Ecolab established Zurich as its Europe, the Middle East and Africa headquarters. In July 2011, Ecolab announced a merger with Nalco Holding Company, Inc., and in December 2011 Nalco became a wholly owned subsidiary of Ecolab Inc. after it completed its US$5.4 billion acquisition. In May 2012, Microsoft co-founder Bill Gates, through his investment vehicles — Cascade Investment and the Bill & Melinda Gates Foundation — increased his stake of 10.8% in Ecolab to 25%. In August 2012, Ecolab opened its Taicang, China, manufacturing plant. The facility, one of the company's largest, helped expand Ecolab's presence in Greater China and was the company's first plant to recycle 100% of its wastewater. In October 2012, Ecolab entered an agreement to acquire Champion Technologies. That purchase closed in April 2013. In November 2014, Ecolab, working with TruCost, launched the Water Risk Monetizer. It provides industry an online, no-cost financial modeling tool to assess and monetize the risk of water scarcity to their operations. In November 2015, for $40.5 million Ecolab acquired the U.S. operations of Charlotte, N.C.-based Swisher Hygiene which provides hygiene and sanitizing solutions for the foodservice, hospitality, retail and healthcare markets. In July 2016, Ecolab made a minority investment in Aquatech International, LLC of an undisclosed amount. Ecolab provides water, hygiene and energy technologies and services to the food, energy, healthcare, industrial and hospitality markets. The company's food safety services provide consulting to restaurants, hospitals, food retailers and food & beverage manufacturing facilities. It is also a supplier of chemicals used by beef and poultry processors - to reduce pathogens, such as E. coli and salmonella - in uncooked beef and poultry. ^ a b c d e f "Ecolab Inc. 2017 Annual Report (Form 10-K)". sec.gov. U.S. Securities and Exchange Commission. February 2018. ^ "2014 Annual Report: 10-K". Ecolab. 28 February 2014. Retrieved 30 November 2014. ^ "Ecolab". Fortune. Retrieved 2018-11-24. ^ a b c d "Fundinguniverse.com | Ecolab". Retrieved 25 July 2012. ^ "stake in Ecolab could get bigger". Reuters. 7 May 2012. Retrieved 25 July 2012. ^ "Ecolab Expands". PCT Magazine. Retrieved 2018-07-10. ^ a b "Ecolab Closes on European Acquisition". 30 November 2001. Retrieved 25 July 2012. ^ a b "Ecolab timeline" (PDF). Archived from the original (PDF) on 17 June 2012. Retrieved 25 July 2012. ^ "Black Pearl Award". International Association for Food Protection. Retrieved 2018-07-10. ^ "Ecolab Introduces Clearly Soft and ZephAir". investor.ecolab.com. Retrieved 2018-07-10. ^ "Henkel Directors to Resign from Ecolab Board". Reuters. July 2008. Retrieved 25 July 2012. ^ "Henkel announces successful public offering of its shares in Ecolab". November 2008. Archived from the original on 24 May 2013. Retrieved 25 July 2012. ^ "SEC filing: NALCO Holding Company". mobotecusa.com. December 2011. Retrieved 21 July 2012. ^ "Bill Gates Gets OK to Up Stake in Ecolab to 25%". 8 May 2012. Retrieved 25 July 2012. ^ "Bill Gates' stake in Ecolab could get bigger". 7 May 2012. Retrieved 25 July 2012. ^ "Reuters company profile - Ecolab". Retrieved 25 July 2012. ^ "Ecolab Makes Equity Investment in Aquatech International". Archived from the original on 2016-08-25. Retrieved 2016-07-27. ^ "Ecolab makes Equity Investment in Aquatech International". Ecolab. Archived from the original on 2016-07-28. Retrieved 2016-07-27. This page was last edited on 23 April 2019, at 05:53 (UTC).